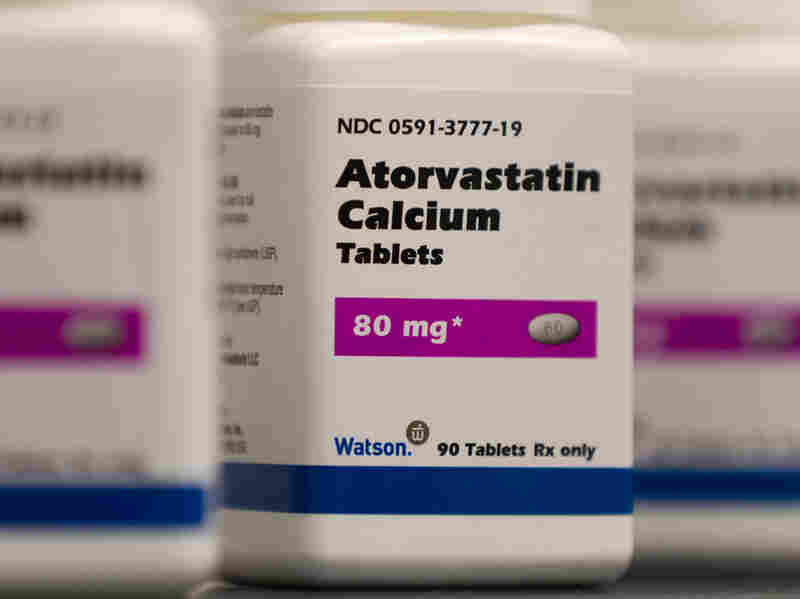 Cholesterol Guidelines Could Mean Statins For Half Of Adults Over 40 : Shots - Health News New advice to reduce heart attacks and strokes could more than double the number of Americans taking cholesterol-lowering statins to 56 million. The expansion could cost as much as $7 billion a year. When sweeping new advice on preventing heart attacks and strokes came out last November, it wasn't clear how many more Americans should be taking daily statin pills to lower their risk. A new analysis provides an answer: a whole lot. Nearly 13 million more, to be precise. If the guidelines were followed to the letter, about half of all Americans over 40 would be on cholesterol-lowering statins — more than double the current level. Even more striking, the new recommendations would make prescription of the drugs almost universal among older men. "What was personally most surprising to me, is that it turns out the difference between the old and new guidelines is very small in younger adults — 40 to 59," says Duke University biostatistician Michael Pencina, lead author of the study. "The vast majority of those affected by the new guidelines are between 60 and 75," he says. "So much so that 87 percent of men 60 to 75 and 54 percent of women [in that age range] should be on statins." The great majority of Americans newly recommended for statin treatment have no known heart disease, Pencina and his colleagues say. The analysis was published online Wednesday by the New England Journal of Medicine. Statin drugs are pretty cheap these days. Most are generics. Common doses of atorvastatin, the generic form of Lipitor, can be had for 50 cents a day. Older statins cost even less. Still, the number of potential patients is so huge that the recommended expansion in treatment has major cost implications. If all those newly recommended for treatment got the drugs, the expansion would cost from $2 billion to $6.6 billion a year more than the price tag under the old guidelines, which is $7.8 billion to $22.4 billion depending on cost assumptions for a year's worth of the drugs. In fact, far from everybody eligible for treatment under the previous guidelines is taking statins. Pencina and his colleagues calculate that 22 percent of adults between 40 and 75 are on statins now — about 60 percent of the recommended number. About 25.2 million people take statins now, at an annual cost of about $6 billion to $13 billion. The new guidelines more than double the potential number of statin-takers to 56 million people. Pencina says over 10 years, the change in statin use could potentially prevent nearly a half-million heart attacks, strokes and cardiovascular deaths. He thinks the benefit could be worth the lifetime cost of statin treatment, which he thinks could be well below the cost of treating the victims of heart attacks and strokes over their remaining lifetimes. "We're going to identify more people at truly high risk and give them more statins, so we'll potentially prevent more cardiovascular deaths," Pencina says. But the price will be a good deal of overtreatment. "We will treat a fair amount of people who will not have developed the disease," he says. And the drugs come with side effects, including an increased risk for developing diabetes. The new guidelines, formulated by the American Heart Association and the American College of Cardiology, are a major departure from those in place for decades. They throw out the notion that doctors should prescribe cholesterol-lowering drugs when a patient's LDL, or bad cholesterol, reaches a certain threshold — in recent years, above 130. Instead, the new guidelines say everybody with known heart disease should be taking statins. And for adults over 40 without known cardiovascular disease, the new trigger for statin use is a 10-year risk of heart attack or stroke of 7.5 percent or more, according to a new risk calculator. The old guidelines, using a different calculator, prescribed statin use at a 10-year risk above 20 percent, along with an LDL-cholesterol reading above 130. Under the new guidelines, statin therapy is urged for everybody over 40 who has diabetes. The drugs are also recommended for younger adults if their LDL cholesterol is over 190. It's not yet clear what the impact of the new recommendations has been. They're complicated for doctors and patients to understand, and they're controversial in the medical community. "I've hear very varied responses," Pencina says. "Some say the guidelines overtreat in the older age group. And I have colleagues who say the guidelines don't go far enough in the younger age group." The new analysis used data from the National Health and Nutrition Examination surveys to estimate the effect of the current cholesterol guidelines.